Included Safari Extension. No additional Safari Extension download necessary. 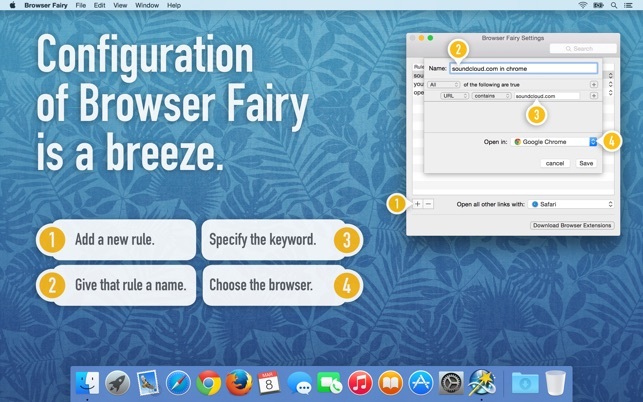 Just activate the Browser Fairy Safari Extension in Safari right after installing Browser Fairy. I needed a easy, fast way to manage my work Google Drive account and my personal Google Drive account. Solution, stay logged into my personal GD account in Safari and stay logged into my work GD account in Chrome. But it still was a hassle copying and pasting url’s into the right browser. 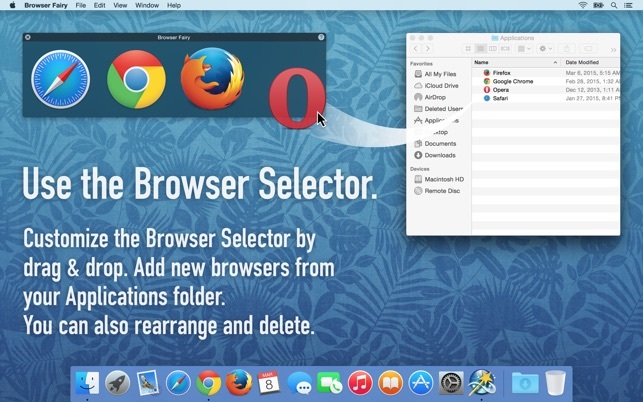 Solution-Browser Fairly. I simply entered the url’s for work into Browser Fairy and had them automatically opene in Chrome. Same idea for Safari. AWESOME. BTW, I first tried Choosy as a way to manage my browsers. Bad decision. Choosy was not installing correctly into my Preferences for some reason. Others online expressed the same problem. I contacted the developer and he never responded. Poor form. IMO, stay away from Choosy b/c of poor customer support and a buggy install issue. 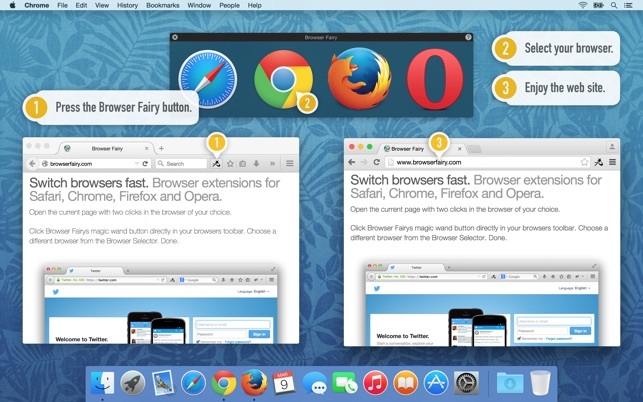 Browser Fairy just works. You set it to be your default browser and it silently and seamlessly routes URLs to whatever browser you want based on customizable rules. The interface is simple and clean. Once I've set up my rules, I really don't even remember it's there--but my links automatically go to different browsers based on the rules I've set up. 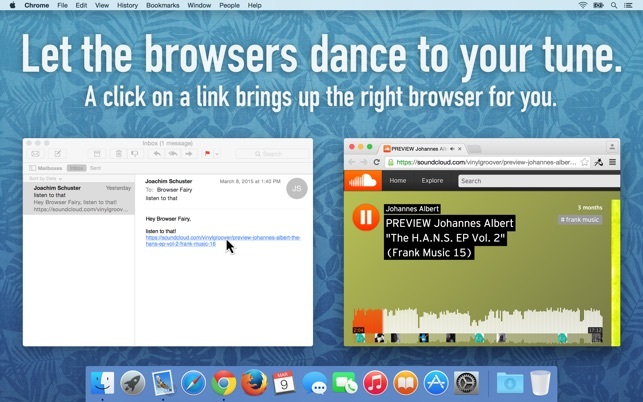 A must for people who use different browsers for different links. I use Epichrome to create single-site browsers and Browser Fairy works extremely well with those apps for routing links in complicated ways. 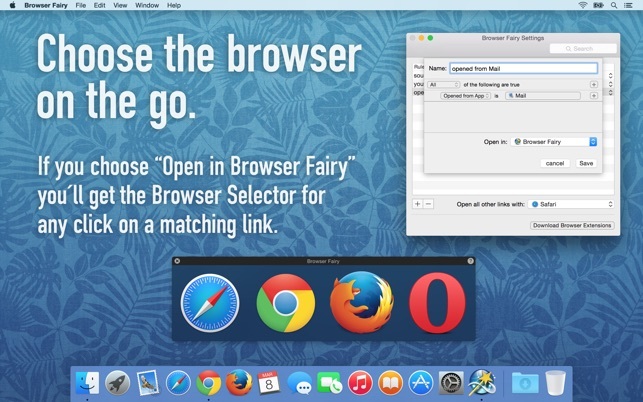 I have been using Browser Fairy for the past 6 months. The only feature I wanted was to have keyboard shortcuts to quickly open my browser of choice without clicking. That has now been added and it is great. Also, the new version does seem to open browsers much faster.